With my RA I used to suffer from pain and severe swelling in the knees, often aggravated in the morning after sleep. In this video we look at one of the ways to minimise this morning stiffness. Good day, it’s Clint Paddison here with another tip for you on reversing rheumatoid arthritis symptoms naturally. And I’m going to share a story with you today that I was just reminded of when I looked outside here in Orlando and this driveway can become very slippery. And I remember when I was really struggling with my left knee which was swollen up like a rockmelon or cantaluope if you’re in the US and it was full of fluid and was extremely painful and stiff that walking down this driveway and wet surfaces in general used to be a huge problem for me because I wasn’t able to properly bend my lower part of my leg. And so I bleed with the heel and often go to pull over and slip. And so let me explain to you something that was very very useful for me when I was struggling with that knee problem. And it’s something that isn’t exactly intuitive or obvious. And so I think you’ll find this very very valuable. What I used to find is that when I would wake up in the morning I would always have more knee problems than when I went to bed the night before. And I know that sounds obvious when you have RA because we always wake up with morning stiffness and it’s one of the kind of classic symptoms of rheumatoid arthritis. However with the knee, it was more extreme than the other joints. I used to find that the other joints would wake up a little more stiff and they would loosen up through the day through a period of several hours. But the knee joint used to seem to really get aggravated while I was in bed. And this used to really add to a lot of my confusion. Well after many many months of wondering what’s going on, I worked out a way of actually resolving this and putting together a small tweak that made a huge difference. They say that small hinges can swing big doors. Well this little tip made a big difference for me. So I haven’t got the materials with me. But bear with me as I explain what all you need to pull this off. So what was happening at night is that my knee was being forced down in compressed from gravity which was pulling it down in this direction when I was sleeping on my back. So if I was lying on my back then the weight pressure on the leg with gravity being pulled down this way was forcing this knee to being squashed down. Now what that was doing was actually compressing that sinuvitis, the inflammation the swelling inside the knee joint and actually aggravating and causing more inflammation. Now the problem wasn’t happening so much when I was sleeping on my side. But when were uncomfortable, I had elbow problems and wrist problems and you name it problems. And so I was moving around a lot during the night. And invariably I’d spend part of the night on my back. And so the problem would happen when I was on my back. Now I thought if I can only sleep on my side all night I’ll be fine. But you just can’t you’re too uncomfortable with other joints that are inflamed. And so what I did was I got one of my own t shirts and I folded it many many times to create a small patch. That’s about maybe that long by that long. So what’s that. maybe 15 centimetres by 15 centimetres. And then when I did is I put it underneath my knee like this and I got an ace bandage and wrap the ace bandage around medium tightness and got some butterfly clips that they use at the hospital and clipped that ace bandage on. Now the only purpose of the ace bandage was to hold the spacer. The t-shirt was a spacer. It just occupied about half a centimetre or maybe a centimetre of space underneath the knee. And that space meant that when I was lying on my back the t-shirt took the space rather than my knee being forced down from gravity. Now let me tell you, this made a phenomenal difference in the way that I was waking up in the morning. So now when I was waking up in the morning I wasn’t starting the day like two steps forward compared to when I went to bed. And so then all the additional efforts that I was putting in like following the Paddison Program and also going to bikram yoga each day or getting on my stationary bike. Now advancing me rather than setting me forward a little bit. But then at night doing all this damage just from even like 15 minutes in that position with the knee being pulled down would cause the problems the next day. So I would really encourage you to test this out if you’ve got problems with your knees. Just try putting a space a t-shirt behind the knee, putting the ace bandage on and some little butterfly clips and see whether or not this can reduce the amount of pain you experience when you wake up the next morning. Now there are a lot more things that I did to resolve my knee issues than just this one thing. But I just want to make sure that you understand that that’s not going to solve all the knee problems but that may be a huge step forward for you if you’re struggling with your knees. It could be the difference between making progress or going backwards. And so I hope that’s really useful for you. 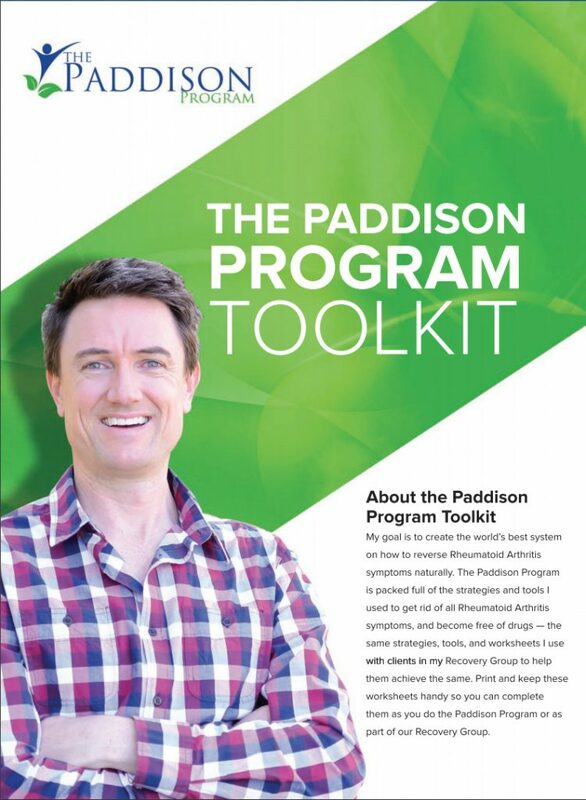 I’ve got a full 52 minute knee problem reversal training comprehensive video inside our Advanced Package of our Paddison Program. So if you like this, you’ve got knee problems, make sure you watch that video and I hope this has served you and I hope that it offers you a way of getting an improved quality of life if you’ve got knee problems. So thanks for watching and happy healing. I’ll talk to you soon.